I have been a volunteer with Soldiers’ Angels for about three years. The purpose of Soldiers’ Angels is to show appreciation to military personnel and their families, offering support and encouragement. Our military and their families sacrifice so much for their country. Soldiers Angels’ provides opportunities to thank them. There are many different ways to be involved in Soldiers’ Angels and volunteers can choose the opportunity that matches their time and interests. Baking bar cookies is fast, easy, AND delicious! I am a member of the Deployed Adoptions Team. My commitment is to send one letter per week and one care package per month to a deployed service member for the duration of his/her deployment. The letters and packages may seem small and boring to us, but to military personnel doing their jobs so far from home, that contact is a bright spot in their difficult days, a much needed reminder that they are remembered and appreciated. It is very humbling and an honor to be able to offer such a boost to morale. A side bonus to my involvement in Soldiers Angels’ is getting to know some of the other Angels. Each team has a Facebook page for questions, answers, and sharing. I met my friend Sue on the Deployed Adoptions Facebook page. Sue is typical of so many of the volunteers with Soldiers’ Angels. She cares deeply for each and every service member she adopts and fills her letters and packages with the same love she would share with family. At first, Sue wasn’t confident about baking for her adoptees, but with a little Monday Box encouragement, she has become an avid baking enthusiast, sending home baked love in most of the care packages she sends. An ideal after school snack! Sue spends a lot of time finding and trying recipes. I am often the lucky recipient of recipes she has found through her research! Whenever Sue finds a winner, she passes the recipe along to me. Recently, Sue created a fun filled “Root Beer Pong” care package with some puffy, chewy root beer cookies. She shared the recipe, which I adapted and tweaked into Root Beer Float Bars. Thank you, Sue! What are the flavors in Root Beer Float Bars? It isn’t easy to describe the flavor of root beer. This sweet carbonated beverage is found predominantly in North America and was originally made using oils from the Sassafras tree or sarsaparilla vine. In 1960, sassafras oil was banned in the United States after it was shown to be a carcinogen and to contain safrol which can damage the liver. Artificial flavoring and/or sarsaparilla root is now used as root beer flavoring instead. There are many different recipes for root beer containing different combinations of spice flavors in addition to sassafras flavor. Some commonly used root beer spices include vanilla, wintergreen, licorice root, nutmeg, allspice, and cinnamon. A Root Beer Float Bar could easily be called a Spice Bar or Sassafras Spice Bar to accurately describe the flavor. A snacking bar full of warming spices! 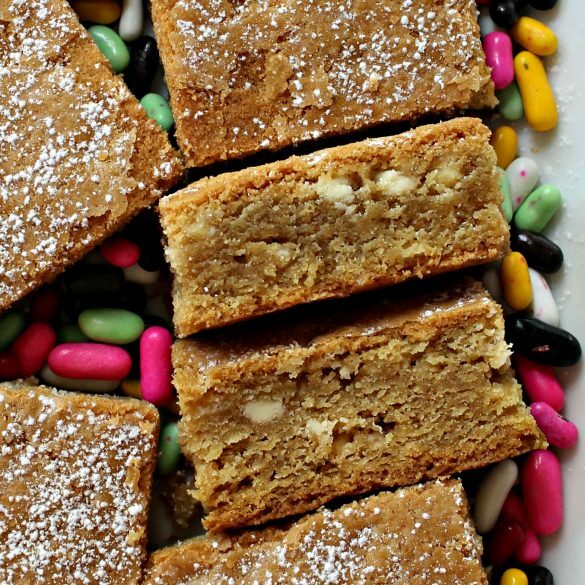 Most chewy cookie recipes can be baked as a bar cookie. Crunchy cookies do not make good bars. 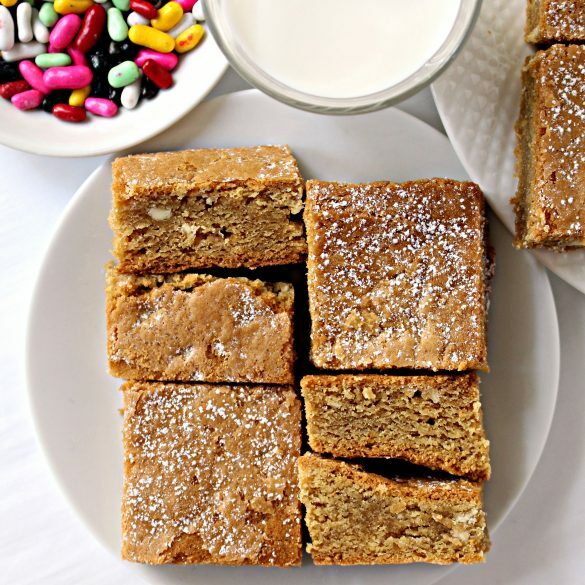 To bake bars instead of cookies, mix the ingredients according to directions, then spread into a lined baking pan. Lining the baking pan with foil or parchment paper, eliminates the need of oiling the pan and makes it easy to lift the uncut square/rectangle out of the pan for cutting. The size of the pan required will depend on the amount of dough the recipe produces and the bar thickness desired. Often, a square 8” x 8” or 9”x 9” baking pan will produce a thick bar cookie and a rectangular 9” x 11” baking pan will produce a thin bar cookie. 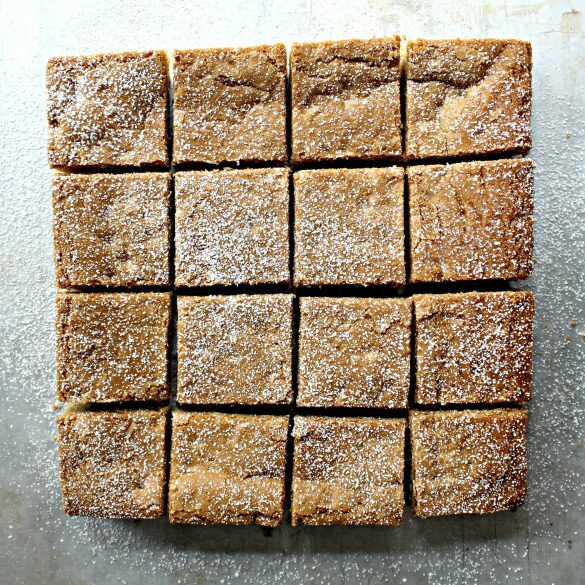 A square pan is used for Root Beer Float Bars and produces a thick, chewy bar. Baking time will be longer than the original cookie recipe. Thicker bars will take longer to bake than thinner ones. Start checking for doneness at 15 minutes, then recheck as needed at 5 minute intervals. 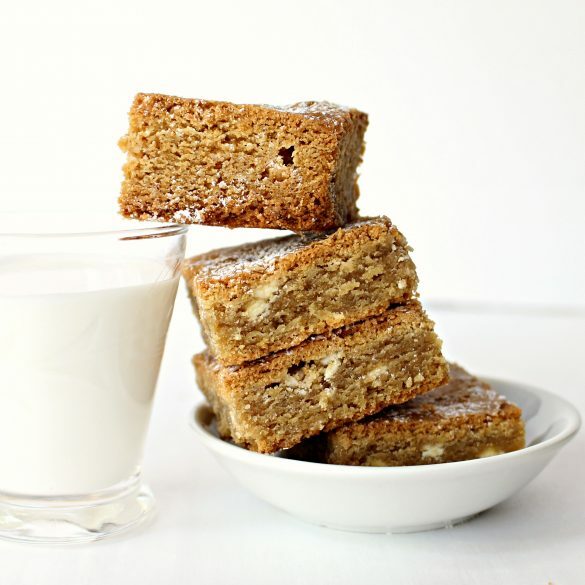 Root Beer Float Bars are baked for 20-25 minutes. This Root Beer Float Bars recipe is adapted from a cookie recipe and offers several advantages over the original recipe. Spreading batter into one pan for baking, is much faster than portioning out individual cookies. 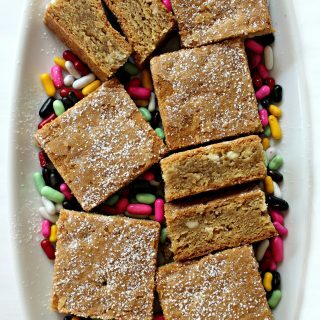 An uncut pan of cookie bars is fast and easy to wrap or vacuum seal. When shipping, uncut pans of cookie bars are sturdier than individual cookies. Especially important for long distance shipping (such as military care packages), uncut pans of bar cookies retain their moist, chewy texture longer than individual cookies. Just like the secret recipes used to make the various brands of root beer soda, each brand of root beer extract/concentrate uses a slightly different blend of spices.For Root Beer Float Bars, I used root beer extract from The Spice House (not sponsored) and these bars received rave reviews everywhere they were sent. The Spice House extract has definite notes of licorice in the flavor profile, which I love. Other brands are slightly different. I suggest experimenting. Experimenting can be delicious. Preheat the oven to 350° F. Line an 8” x 8” or 9” x 9” baking pan with parchment paper, leaving an overhang on all four sides. In the bowl of an electric mixer, cream together the butter and sugars. Mix in the pudding mix powder. Add the eggs and root beer extract and mix until combined. Add the flour and baking soda and mix until incorporated. Press the batter as evenly as possible into the prepared baking pan. Using a sheet of wax paper over the batter, press down to flatten and smooth the top of the bars. Bake for 20-25 minutes, until a toothpick inserted in the middle, come out clean. Remove the pan from the oven and cool for 20 minutes. Use the parchment overhang to lift the dough out of the pan and onto a wire rack to cool completely. Use a serrated knife to cut into 12 bars. Store at room temperature in an airtight container for up to one week. Wrapping the pan uncut will extend the shelf life for up to 10 days. Wrap individual bars in plastic wrap. Stack the wrapped bars in a freezer weight ziplock bag. For long shipping times, use plastic wrap to wrap the entire pan of bars uncut. Place the wrapped square in a freezer weight ziplock bag or vacuum seal. There are lots of additional bar cookie options on The Monday Box to speed up your baking with delicious results! Take a look at these recipes for snacking, care packages, and gift giving! What a great project. I love root beer and so these bars sound fabulous. Thank you for sharing at Reader Tip Tuesday. Thank you, Amy! 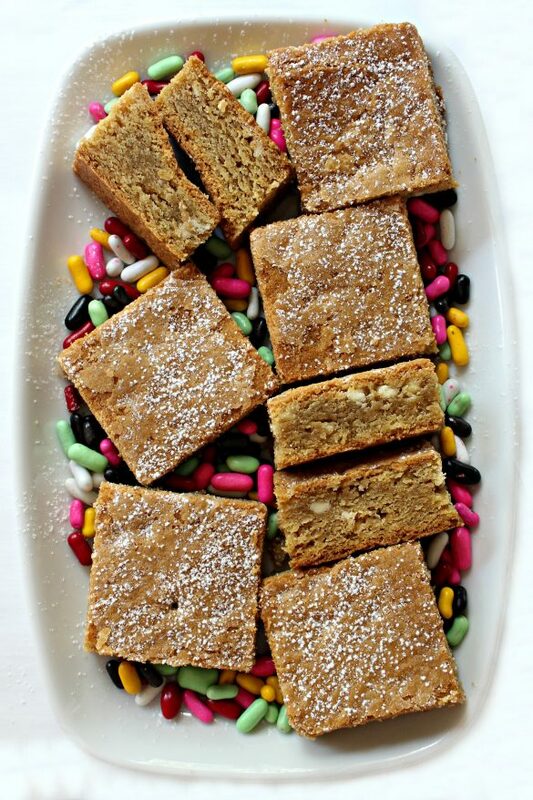 Root beer flavor makes a delicious spiced bar! These sound great! I bake for a local theatre so these are perfect! Though I’m not fond of Root Beer, I love Root Beer floats. Crazy, I know. So your Root Beer Flat Bars are intriguing, and I would love to make them. Hi, Angie. Though I love root beer, I wasn’t so sure about root beer flavored baking, but was pleasantly surprised! They are like spice bars with a touch of licorice. Each flavoring is slightly different, just like root beer brands are slightly different. I love a Root Beer Float, this is a great bar and a great idea! Thanks so much for sharing with us at Full Plate Thursday. Hope you have a great weekend and come back soon! I think it is wonderful what you do with the Soldiers Angels organization, Wendy! It is so important to support our military and their families. I was really interested to learn about converting ordinary cookie recipes to bar cookie recipes too. An as for these Root Beer Float Bars, I can’t wait to try to make them. I’m going to have to tuck a box of instant pudding powder in my suitcase when I’m in California next week, and maybe some root beer extract too (although I might be able to get that here). They look so good, and my son and I just love root beer. He lives about 2 hours away and I might even be able to send these to him! Pinning and sharing on the H&S Facebook page later today. Thank you for sharing, and for being a part of the Hearth and Soul Link Party. Hope you are having a great weekend!